Vancouver, BC, Canada - Flowmotion Entertainment announces the release of DELI DASH! Cafe Chef Cooking Scramble and Restaurant Food Fever 1.0 for iPhone, iPad, iPod touch and Android devices. Players can join the cooking adventure and build their restaurant empire. You will have the best ingredients at your disposal and serve delicious treats. DELI DASH! Cafe Chef Cooking Scramble is simple to play yet challenging to master. Food Court fever fans can now play and cook exotic dishes in the new Deli restaurants, decorate it and explore new locations. "DELI DASH! Cooking Scramble" brings bright, spirited HD graphics, and super engaging characters. This is not your average restaurant simulation game, it provides a spectacular Deli restaurant theme with lots of crazy characters. The game is beautifully designed, easy to play and awesomely rewarding. "DELI DASH is an exciting addition to Flowmotion's Food Court Fever series," said, Dario Pavan, CEO of Flowmotion Entertainment. "The game is packed with cooking frenzy. And the team is extremely proud of the new title and offers a unique cooking experience. So much detail have gone into designing the game, that the food is enough to make players hungry." The game currently features 70 different levels across 7 locations. The earned coins and gems can be used to purchase ingredients making your menu more appealing. The game also provides several in-game boosters to serve your customers faster. These can be earned or bought using in-app purchases. 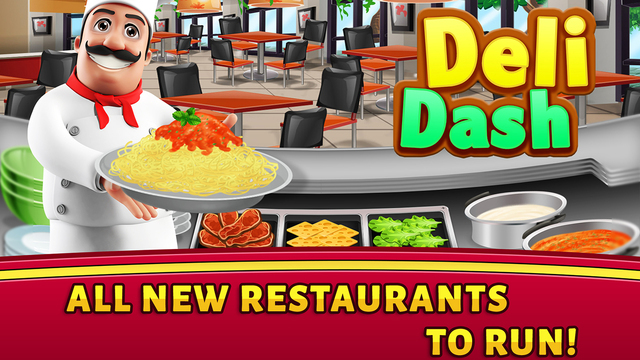 This all-new restaurant game comes with HD graphics, sound and game play. "DELI DASH! Cooking Scramble" is sleek, challenging & feature rich to provide players with a frenzied multi-tasking experience. The app is available for both iOS and Android devices. This cooking game is free for all users and has options for in-app purchases. DELI DASH! Cafe Chef Cooking Scramble and Restaurant Food Fever 1.0 is free, and is available worldwide through the App Store in the Games category. An Android version is available through Google Play. Flowmotion Entertainment Inc. is committed to building fun games that can be enjoyed by the whole family and by boys and girls, men and women, of all age groups - kids, adults, and older generations. The company was founded in 2014, and is a fast growing mobile game studio, which has published dozens of games enjoyed by over 5 million people around the world! All Material and Software (C) 2016 Flowmotion Entertainment Inc. All Rights Reserved. Apple, the Apple logo, iPhone, iPod and iPad are registered trademarks of Apple Inc. in the U.S. and/or other countries. Other trademarks and registered trademarks may be the property of their respective owners.